I ride because I can. I ride because cancer seems to hit closer to home for me each year. This will be my 7th year riding in the Pan Mass Challenge (PMC), my 4th year riding for Robert Kraft's, Patriot Platelet Pedalers Team. The PMC is a 163 mile bike ride from Wellesley to Provincetown and is the largest, single fundraiser in the United States raising funds for life-saving cancer research at the Dana Farber Cancer Institute in Boston. Since my first ride in 2013, with your generosity, I have raised almost $35K! I am committed and dedicated to this fight. Although my individual commitment is to raise $5,000, my personal goal is $5,500. Last year, the PMC was able to provide Dana Farber with a donation of $56 Million! Please consider donating to this amazing cause as 100% of your donation goes directly to the cancer-fighting research. Let's all help save some more lives! Thank you so much for the continued support. I ride because I can. I ride because cancer seems to hit closer to home for me each year. Riding is the easy part. The hard part is watching those you love go through horrific cancer treatments, missing out on parts of their lives they'll never get back or watching friends suffer the loss of loved ones who lost the fight. This will be my 5th year riding in the Pan Mass Challenge (PMC),163 mile bike ride from Wellesley to Provincetown. It is the largest, single fund raiser in the United States raising funds for life saving cancer research at the Dana Farber Cancer Institute in Boston. Since my first ride in 2013, with your generousity, I have raised over $21K. I am committed and dedicated to this fight. Although my individual commitment is to raise $4,800, my personal goal is $5200. Last year, the PMC was able to provide Dana Farber with a donation of $47 Million! Please consider donating to this amazing cause as 100% of your donation goes directly to the cancer fighting research. You can help me put an end to it. Thank you so much for support. I've been out on the road training for my third Pan Mass Challenge (PMC) which will take place on August 1st and 2nd. The PMC is a 163 mile bike ride from Wellesley to Provincetown and is the largest, single fund raiser in the United States, last year raising another record- breaking $41 Million for Cancer research at the Dana Farber Cancer Institute. I’ve said from the beginning in 2013 that I would continue to ride the PMC as long as I am financially and physically capable of doing so. It had that much of an impact on me. But this year, as I started to think about riding again, I honestly had some second thoughts. Last year was one of the most difficult, physically challenging things I have ever been through. It was the rainiest and coldest PMC on record out of the 35 year history of the event. I have never been so cold or soaked to the bone in my life. The camaraderie amongst the riders was diminished; there was very little conversation, no smiles or laughter. Everyone was just riding as fast as they could, as safely as they could, to get to the finish to get warm and dry. We all contemplated quitting Saturday evening but we didn’t. We didn’t quit because it was just rain. It was just cold. It wasn’t Cancer. What we were going through was miniscule compared to what thousands of children and adults are going through every day. We were all riding for the same reason. We were all riding because somehow we have all been impacted by this horrible disease. And this year, it has hit much closer to home for me. Two people I have known for years, one I consider a sister, have been diagnosed with Cancer and are now undergoing treatment at Dana Farber . After hearing this news, there was no doubt in my mind I would ride again. This year, my ride will have a whole new meaning. This year, I'll be adding two new names to my back. I am praying Mother Nature is kinder to us this August. I am praying the sun will be shining, the temperature is a perfect 72 degrees and the camaraderie returns. We’ll still face the challenge regardless, but it would certainly be nice. Your support for my ride is incredibly appreciated. With your help, I was able to raise over $5,500 last year for the Dana Farber Cancer Institute. Collectively, the 2015 PMC goal is $45 Million! Our individual fundraising minimum is $4500. I have committed to raising this and hope you can help. 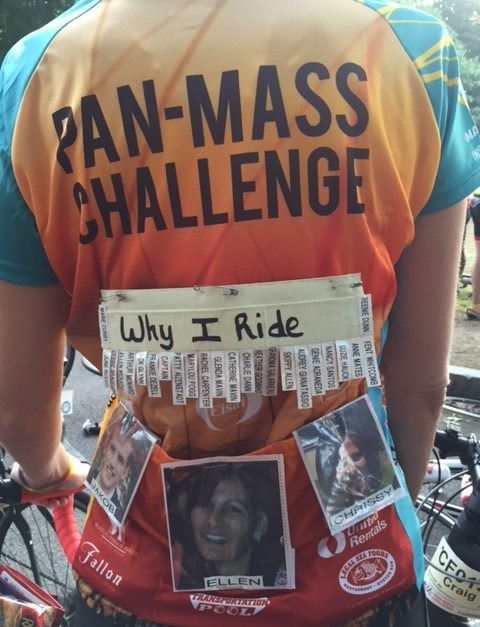 I rode in my first Pan Mass Challenge (PMC) in August of 2013. I am still amazed when I think back at what we all accomplished. I started as a novice road cyclist purchasing my first bike in April of that year to riding 164 miles in 2 days after only 4 months of training. Crazy! Jitters…. The night before was anxiety filled- PMC Registration and then so much to pack, logistics to work out- zero sleep! I honestly do not know how we managed to function that next morning at 3:45AM! I like to think the cancer survivors and angels whose names I pinned to my back were sending us hope, strength and beautiful weather. The starting line was nerve-racking. Picture thousands, yes thousands of yellow jerseys trying to find their place. Which group do we belong in? Are we fast riders? Are we intermediate riders? Are we slow riders? I never imagined I would belong with the fast riders after only 4 months of riding a road bike. But with some guidance from our fellow training buddies and PMC alumni, we were advised to join the fast group. We scooted up to about the 4th row of the fast section so we could get out quickly and avoid the large crowd. When the gates were pulled and the official start announced at 7AM in Wellesley, we were off! After what seemed like just a few minutes of riding, we were already through Needham. How did that happen? Next thing I know, I’m at the first water stop in Wrentham. Twenty miles already? Wow! Then, about 5 hours and 60+ more miles later, we finished in Bourne at Mass Maritime for the day. It was officially the longest ride we had done in one day- 84 miles! Emotions kicked in, hugs, kisses and high fives were given, tents were assembled, lots of Tylenol was ingested, and then we settled in for an afternoon of massages, relaxation, music, food and of course, beer- all served to us by 100’s of gracious volunteers. We were in our tents and resting by 8:00PM, ready to take off at the crack of dawn the next morning. Day 2… It was still pitch black at 3:45AM when we strolled out of our tents on Sunday. We loaded up on the official “PMC breakfast sandwich”, bacon, egg and cheese on an English muffin, dressed and packed up our tents and gear in the dark and then headed to find our bikes. The sight of 1000’s of cyclists riding over the Bourne Bridge as the sun came up on Sunday morning was spectacular. At 5:30AM, there were already spectators waiting for us at the end of their drive-ways, pj’s on and coffees in hand, cheering us on. The Cape… Sunday was the most memorable I think. The roads were lined with people. The water stops were packed with family, friends and volunteers. There was music, food, even ice hills to sit on for those with sore behinds. Along the way, the camaraderie amongst the riders was incredible. For miles, I looked at beautiful photos of loved ones and hundreds of names and memorabilia pinned to fellow rider’s backs. We saw signs being held by children saying, “I Am Alive Today Because of You” and “Thank You”. We even saw a few very special signs being held just for us personally. When we road into Provincetown at about 11:30AM that morning, the feeling of accomplishment was amazing. I couldn’t believe I had actually ridden my bike through 40 towns in 2 days! What was even more unbelievable was that I actually felt great, and I probably could have ridden another 20 miles or so. How did that happen? All of those countless, early Sunday morning training rides and weekday spin classes paid off I guess. What I expected about this whole adventure proved to be true- It was very much an emotional challenge as it was physical. The adrenaline running through our veins, our family and friends who met us along the way to encourage us, all of the hundreds of supporters and Cancer survivors along the route, many personally thanking me by name, as well as the dozens of pediatric oncology patient’s photos lining the road on our way into the Lakeville water stop, helped pull me up those hills. I cannot tell you how emotional this experience was for me. I felt so incredibly strong both days. We all road faster and stronger than we did during any of our training rides. We were Superheroes! The whole experience was truly unforgettable. There’s no doubt in my mind I will ride again in 2014, and I might even wear a cape on my helmet! To all that donated to our ride last year, we want you to know that we couldn’t have done it without your help. You have helped save someone’s life and you should be very proud. 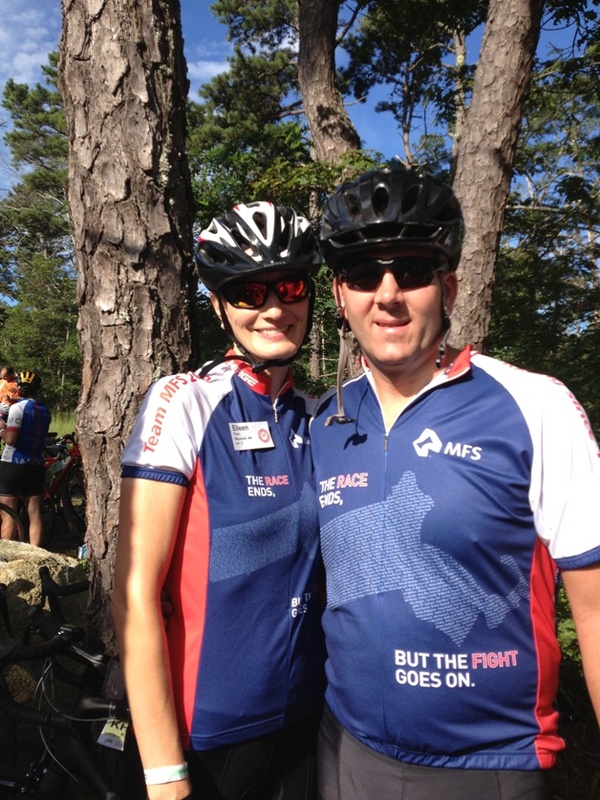 With your support, Craig and I were able to raise approximately $10,000 for Cancer research- 100% of which went directly to the Jimmy Fund and the Dana Farber Cancer Institute. We are so happy to be a part of a PMC fundraising record - $39 Million was raised by the PMC in 2013! Woohoo! My wish as I continue to take on this challenge in the years to come is that they’ll be fewer photos lining that road in Lakeville and that Cancer will be nothing worse than the Chicken Pox. Hopefully, some of you will join us in 2014! I'd love to be able to at least match my 2013 fundraising for my 2014 ride. Can you help? Any dollar amount you can donate will get researchers that much closer to a cure!! Who doesn’t know someone, a family member, a friend, a co-worker, a neighbor, even yourself who has somehow been affected by Cancer? So many people lose their lives every year due to this devastating disease. There is something we can do to help! 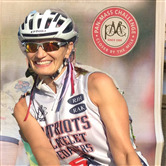 Last winter, a very close friend of mine said to me, “I’m thinking about riding the Pan Mass Challenge (PMC) in August”. I think my initial response was something to the affect of, “Are you crazy? Isn’t that like 170 miles?” But then I observed his dedication over the next several months of training, those long weekend rides in the rain, in the cold and in the blistering heat. He was committed, and I was proud. I was proud of his perseverance and strength. I was proud of his commitment to raise money for those suffering from Cancer. On the second day of his ride, I got up at the crack of dawn and drove down to Provincetown with my friend’s husband to be there when he finished. We watched as people of all ages, shapes and sizes finished their ride, some with cuts and bruises from falls along the way, some wearing photos of those they were riding for and some even riding the bikes of their children they lost to Cancer. I was so filled with emotion when my friend crossed the finish line that I decided I needed to be a part of the PMC. On August 3rd and 4th of this year I will be riding amongst 5,500 other cyclists, all with a common goal- to help put an end to Cancer. I know I have a very challenging ride ahead of me these next several months but it will not be nearly as difficult as the treatment millions of children and adults go through every day to fight this horrible disease. If they can go through that, I can do this. I’m committed. Can you help? Any donation amount will be greatly appreciated and get researchers that much closer to finding a cure! Closer by the Mile! You continue to amaze me each year with your dedication and commitment to others and to help find a cure for this awful disease. Thank you to you and your team for all that you do!